Our Bronx eye doctor offers the full spectrum of eye care services. Whether you’re visiting for a comprehensive eye exam, contact lens fitting, advanced screening, treatment for ocular conditions and diseases or emergency eye care service, our practice offers it – and more! Visit Dr. Ralph Paternoster for professional eye care. 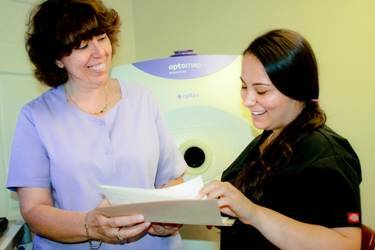 Annual eye exams are vital to maintaining your vision and overall health.We at Park Proffesional Eyecare, Optometrist Bronx, offer the optomap® Retinal Exam as an important part of our eye exams. Your Bronx eye doctor, Dr. Ralph Paternoster, can help you keep up-to-date about your eye health. Learn more about the causes of low vision and what a diagnosis of low vision means.